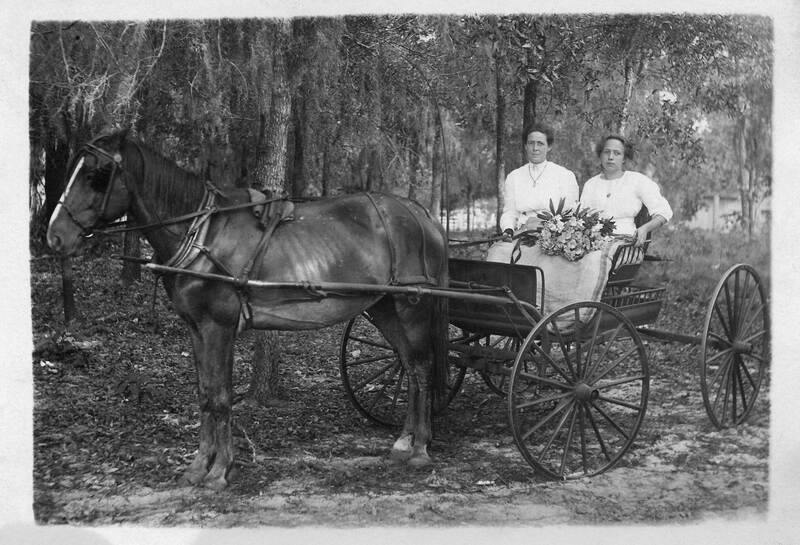 Unlabeled Dodge Photo - Believed Sarah & AdelaThe origins and lives of Rufus and Sarah Dodge probably make them one of the most mysterious, confusing, and intriguing couples in my family tree. They have definitely caused me the most grief in my digging, but in Sarah's case, the most rewarding when I found answers. Together they lived in what’s written as Springfield, Mahoning, Ohio in 1860 where Rufus was working as a Day Laborer.12, F They would have 3 daughters, Harriet Adaline, Frances Jane and Georgia Anna. Rufus and Sarah liked to use nicknames and nicknamed their daughters Hattie, Frankie, and Georgie. Dodge Family 1880 CensusBy 1863, Rufus is officially documented in the profession of stage coach driver in Springfield13 and later referred to as a Teamster. Rufus would have driven paying customers from town to town like a long distance taxi. It is believed he held this profession much longer than noted.G Stage coach driving was dying by the mid 1860's as the railroad was taking the passenger market away from stage coaches. The logical transformation was for Rufus to become a teamster. Teamsters would drive supply wagons pulled by horses from town to town making him the trucker or semi-truck driver of the 1800’s. In the summer of 1868, Harriet would pass away from consumption15 (now known as tuberculosis) and her daughter Adela Harriet Wilford, who is just over a year old, would come to live with her grandparents Rufus and Sarah. A Sarah's sibling Jane Elizabeth Bryant, who is also said to be born in 1827 (confilcting with Sarah's birth year), is also the daughter of Harriet Harris. Jane Elizabeth died young and her children made certian to save documents and paperwork stating her birth date and location in Binghamton, Broome County, New York. It's likely Sarah was actually born in 1829. Not only is there a gap between Sarah's siblings that can place her here, but census records, where the information was likely to come from her directly, seem to average 1829 as her year of birth as well. B Sarah's daughter's death record references her maiden name yet incorrectly lists her birthplace as North Ridgeville, Ohio. An uncited local obituary also lists her maiden name and provides a nickname "Sally" as well, however possibly in error. C Sarah's youngest sister Helen states her whole life as being born in Ohio while all other siblings state they were born in NY. D No state records exist to back this up as marriage records weren't kept in Mercer County until 1880's. 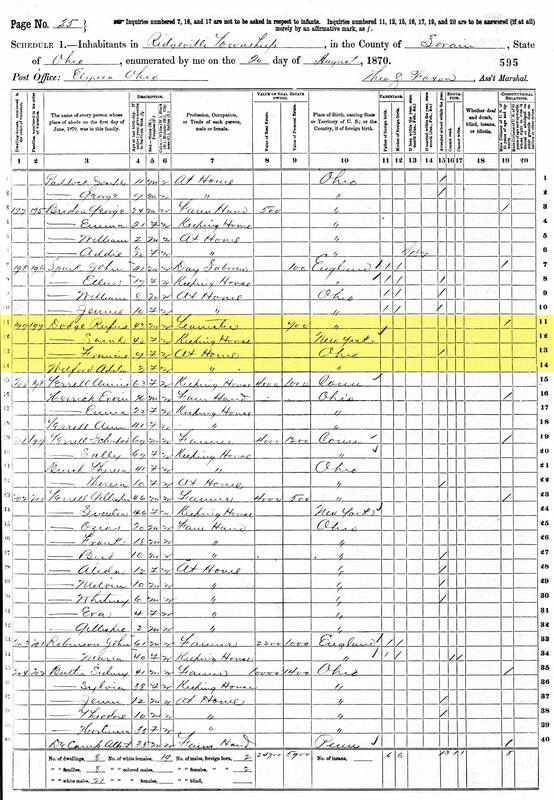 E The Dodge family is missing on the 1850 census. I've checked everywhere and no amount of search combinations, misspellings or wildcards across Ancestry, FamilySearch or HeritageQuest can come up with a result. I've also manually browsed through Pulaski without luck. F Occasionally, I see records listing Petersberg instead of Springfield, it appears Petersberg is small town about 3 miles south of Springfield along the Pennsylvania border. 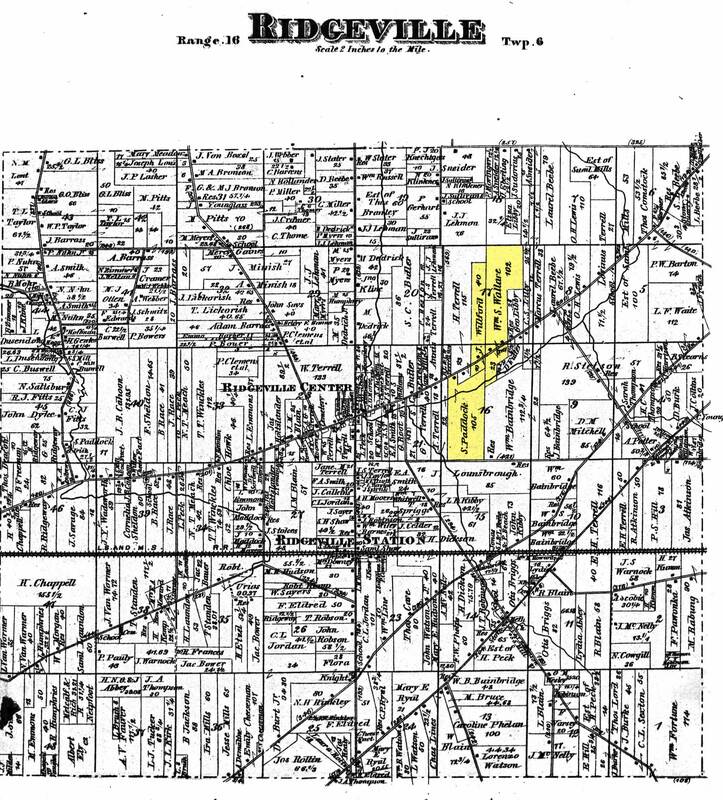 It's common a slightly larger town that may have jurisdiction over the smaller village or township will get listed in some records instead of the actual location of residence. G The rapid decline of stage coaches makes it harder to believe he just suddenly decided in the 3 years following the 1860 census to join a quickly dying field. Especially when his brother-in-law "Frank" had been a stage coach driver for 30 years, and would have been able to deter him and explain how work was drying up. While we know Sarah and Jane Bryant were sisters (a photo held by Jane's family of mother Harriet Harris-Bryant-Platt removes any doubt) we are unsure about which family has the correct year of birth for their ancestor. 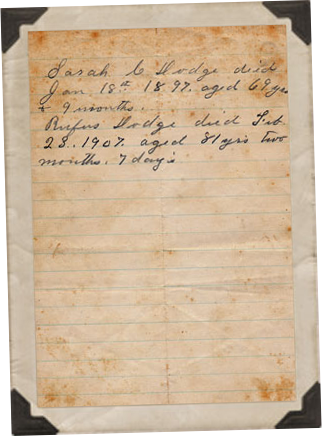 Both Sarah and Jane's families have documents written by their respective ancestor's children saying their ancestor was born in 1827. However, only one has the year accurate. Which one is it? 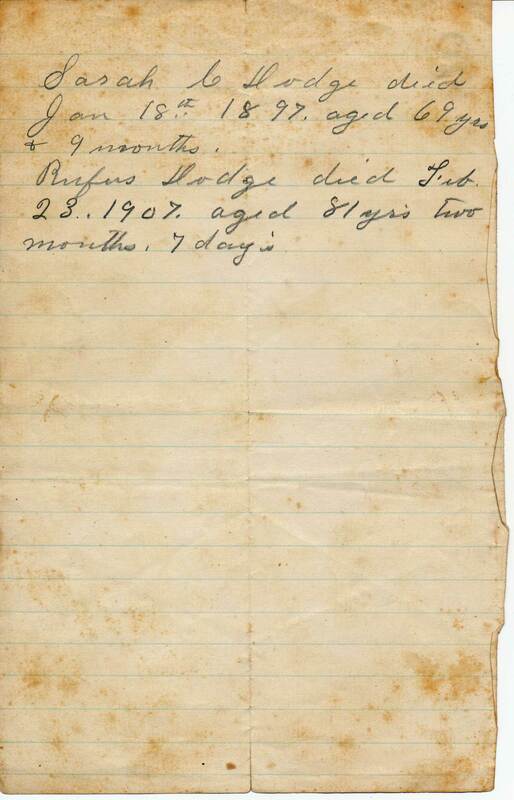 1 Dodge Family Vital Records, an old, weathered piece of notebook paper cataloged with papers of Sarah and Frankie Dodge in what appears to be Frankie’s handwriting. Date of death is listed along with exact age in years, months, days. Part of a box of Kathryn Lowe’s family files & photos currently in my possession. 2 An unsourced family tree compiled by Betty Davis (Winkler descendant) and reassembled by Marilyn Elbert. Part of a box of Kathryn Lowe’s family files & photos currently in my possession. 3 Frances Jane Christian’s Family Date Book; Part of a box of Kathryn Lowe’s family files & photos currently in my possession. 4 Parents Page of Smith Family Bible about Jane Elizabeth Bryant-Smith; Smith Family Bible; Part of William King's family documents. Descendant of Jane Elizabeth Bryant and Sidney J. Smith. 5 Headstone of Harriet Harris; Ridgeville Center Cemetery, North Ridgeville, Lorain, Ohio. Gravestone at West end, middle of graveyard, just under tree. 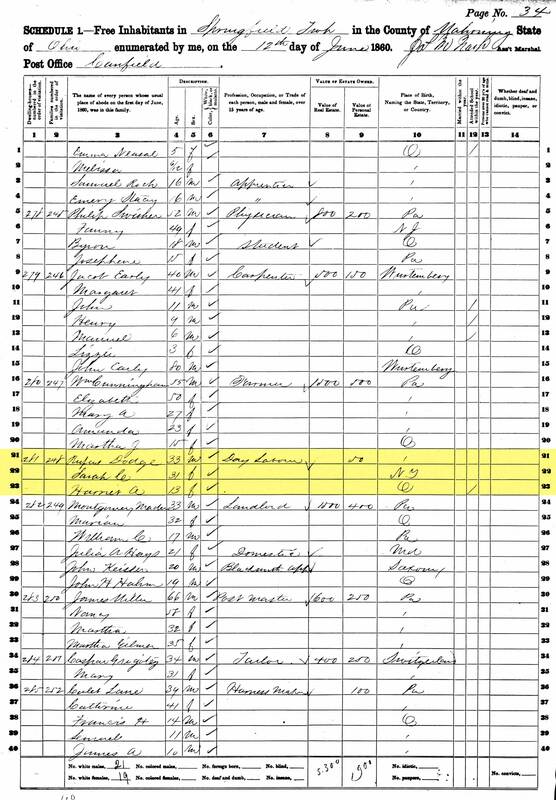 8 1840 United States Federal Census about Harriet Bryant; Year: 1840; Census Place: Warren, Trumbull, Ohio; Roll: 429; Page: 44; Image: 104; Family History Library Film: 0020178. 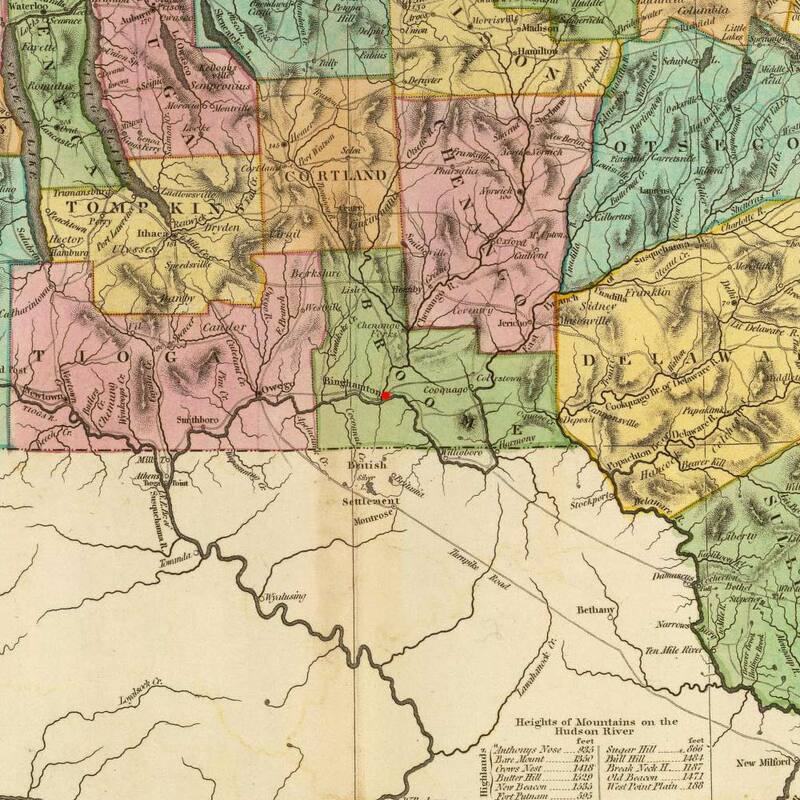 9 Intention of Marriage for Harriet Bryant; "Ohio, County Marriages, 1789-1994," index and images, FamilySearch (https://familysearch.org/pal:/MM9.1.1/X8J2-SZV) : accessed 11 Jan 2014), Melso Platt and Harriet Bryant, 31 Jan 1843; citing Trumbull, Ohio, United States, reference 1842-44 p 81; FHL microfilm 904255. 10 Marriage License for Harriet Bryant; "Ohio, County Marriages, 1789-1994," index and images, FamilySearch (https://familysearch.org/pal:/MM9.1.1/XD72-P2P : accessed 11 Jan 2014), Mils Platt and Harriet Bryant, 04 Feb 1843; citing Ashtabula, Ohio, United States, reference P 33; FHL microfilm 890264. 11 1850 United States Federal Census about Harriett Platt; Year: 1850; Census Place: Pulaski, Lawrence, Pennsylvania; Roll: M432_790; Page: 43A; Image: 91. 12 1860 United States Federal Census about Rufus Dodge; Year: 1860; Census Place: Springfield, Mahoning, Ohio; Roll: M653_1005; Page: 163; Image: 330; Family History Library Film: 805005. 13 U.S., Civil War Draft Registrations Records, 1863-1865 about Rufus Dodge; Consolidated Lists of Civil War Draft Registrations, 1863-1865. NM-65, entry 172, 620 volumes. ARC ID: 4213514. Records of the Provost Marshal General’s Bureau (Civil War), Record Group 110. National Archives at Washington D.C.
14 Marriage Record for Harriet A. 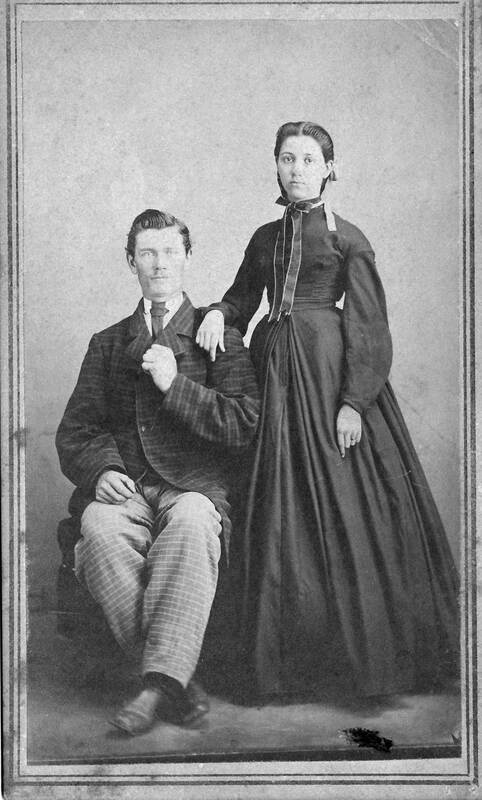 Dodge; "Ohio, County Marriages, 1789-1994," index and images, FamilySearch (https://familysearch.org/pal:/MM9.1.1/X8SJ-NQC : accessed 11 Jan 2014), Joseph Wilford and Harriet A. Dodge, 03 Mar 1865; citing Lorain, Ohio, United States, reference ; FHL microfilm 447524. 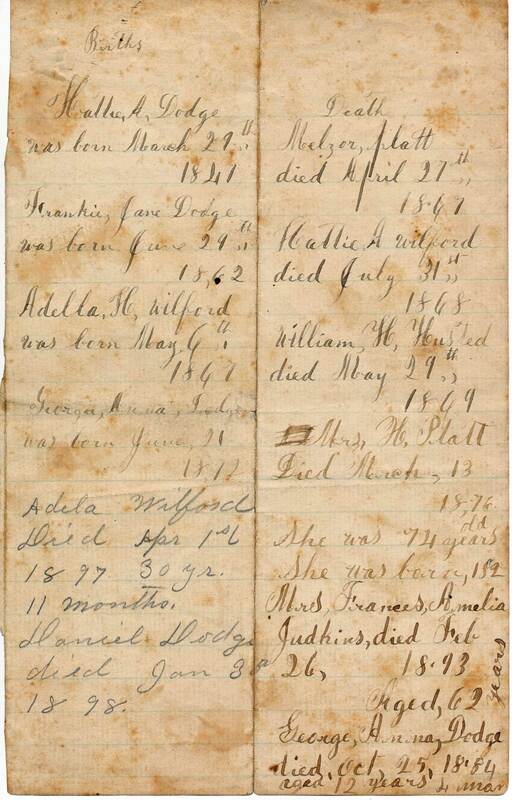 15 Death Record for Harriet A. Wilford; "Ohio, Deaths and Burials, 1854-1997," index, FamilySearch (https://familysearch.org/pal:/MM9.1.1/F6ZJ-X3T : accessed 11 Jan 2014), Harriet A. Wilford, 31 Jul 1868; Reference ID: v 1, pg. 14, fn. 283. 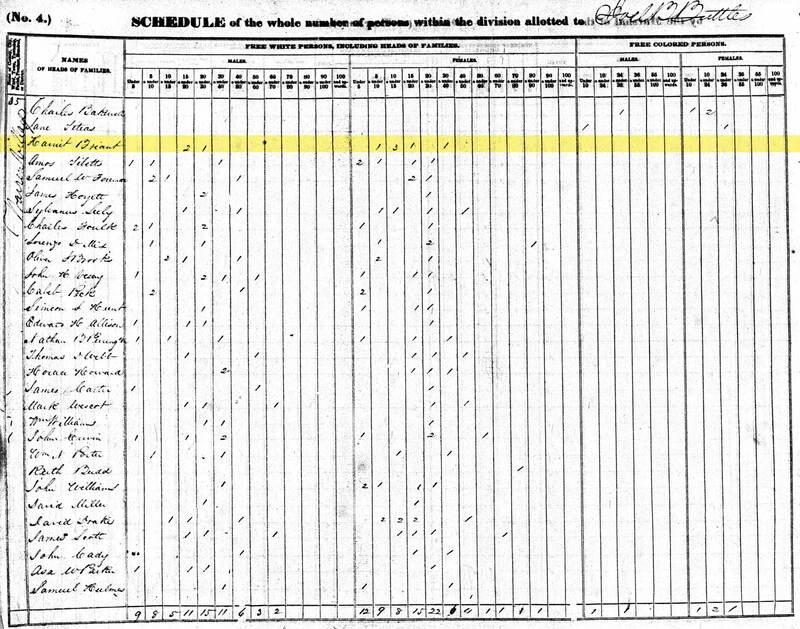 16 1870 United States Federal Census about Rufus Dodge; Year: 1870; Census Place: Ridgeville, Lorain, Ohio; Roll: M593_1235; Page: 595A; Image: 581; Family History Library Film: 552734. 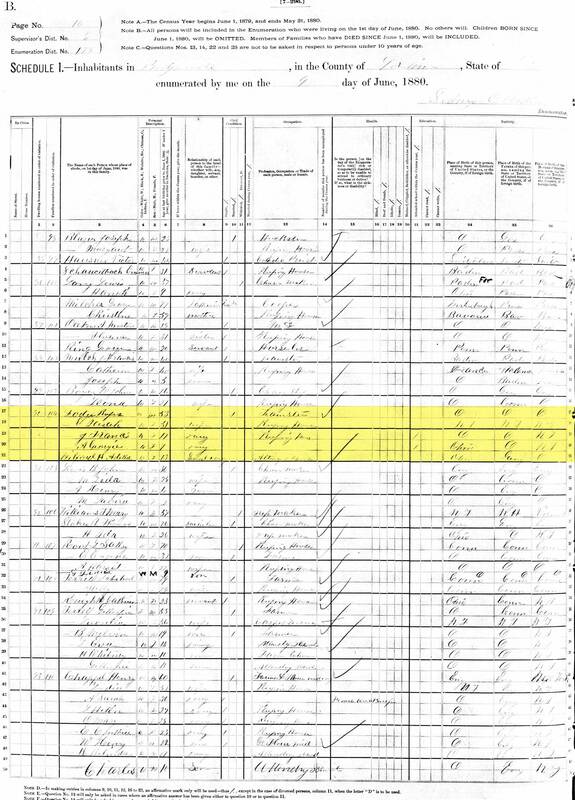 17 1880 United States Federal Census about Rufus Dodge; Year: 1880; Census Place: Ridgeville, Lorain, Ohio; Roll: 1042; Family History Film: 1255042; Page: 559B; Enumeration District: 178; Image: 0468. 18 The Death of Georgie Dodge; Article from The Elyria Republican Newspaper; Elyria, Lorain County, Ohio; Thursday, 30 October, 1884; pg. 1. 19 Death Notice for Mrs. Rufus Dodge (1897); Article from Lorain County Reporter; Lorain County, Ohio; Column: Ridgeville; Saturday, 23 January 1897, page 1. 20 A Pair of Unsourced Newspaper Clippings on Sarah Bryant-Dodge’s Death; Among misc Dodge-Bryant family records; Part of a box of Kathryn Lowe’s family files & photos currently in my possession.